Who Killed Pamela in Peking? This article was first published in the March 21, 2013 issue of The New York Review of Books. Over the last century and a half, scores of books have been written about the foreigners who chose—or tried—to live in China: they include teachers and financiers, traders and political agents, diplomats and musicians, scientists and military specialists, missionaries and surgeons. But in this book Paul French tells us a different kind of story about the sojourners and offers us a new frame in which to place them: his tale takes us into the worlds of the foreigners who had settled in Peking during the 1930s and created new lives for themselves, even if lives of a fragile or fleeting kind, on the edges of society, or else below it altogether. French shows how lodgings did not necessarily determine social class or comparative wealth: some “lived in well-appointed apartment buildings” and “others in cheap flophouses.” Others chose not to have their lodgings known, or lived in both zones, depending on necessity or chance. They could be from anywhere in the world, but perhaps most were American, British, Canadian, or Italian. We meet an American dentist who lived in a luxury apartment in the Legation Quarter, after his wife had left him, taking their three children with her. There was an Italian doctor, kept busy by squads of unruly Italian sailors. The quarter was technically reserved for diplomatic or administrative personnel, but no one could control what happened at the parties there. And if one wanted greater privacy, there were also temples in the beautiful Western Hills that could be rented, with no questions asked, and no prying eyes. Increasing numbers of women who originally had been White Russian fugitives from the Bolsheviks or Jewish refugees from Germany and Central Europe were feeding on the opportunities in China as the rest of the world grew grimmer. Midnight in Peking is both a detective story and a social history, and therefore—as it should—always keeps the hunt for Pamela’s killers somewhere near the center of the narrative. But French never forgets the victim and the little group of family members whose lives lay at the center of the tragedy, and he is a wonderfully dexterous guide in presenting the intersecting nature of the murder evidence with the characters’ own lives and experiences as he unearths it. Most especially is this true in the portrayal of Edward Theodore Chalmers Werner, the father of the murdered young woman. So detailed is French’s portrayal of this tragic but difficult man that it will, I feel, give Werner an enduring place in the often prosaic annals of conventional diplomatic history, and in the even murkier internal politics of the British foreign service. Edward Werner was born in New Zealand in 1864, to a Prussian father and an English mother. His childhood was filled with travel and adventures, and he became at home in several languages. After his father’s death and several years in the academically excellent Tonbridge School, Werner sat for the British foreign service examinations, earning a scholarship for two years of intensive study in Peking as a student interpreter. Excelling at Chinese, Werner was appointed to a series of China postings during the 1890s and 1900s, the most prestigious of which was as the consul general of Fuzhou on the east China coast. He retired from the service in 1914, at the age of fifty. Gladys herself soon fell seriously ill, and was sent to the United States for treatment, but with no effect. 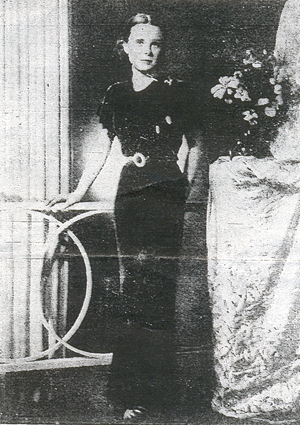 She died after returning to Peking in 1922 (according to her doctors, from meningitis). Pamela was then just five. Again, Werner did not attempt to leave China for life in Europe or the United States but instead decided to stay in China with his daughter, to enroll her in local Peking schools—her Chinese-language skills were already considerable—and to continue with his own ambitious program of travel, research, and writing about China. His courtyard house, rented from a Chinese landlord, was elegantly (if rather heavily) furnished, with spacious grounds and gardens. It stood on a quiet street quite near the British Legation Quarter, but outside the perimeter protected by the British. Father and daughter lived there together for many years, and it was not far from this rented home, in a deserted stretch of wasteland below the southeast watch tower of the old city wall protecting the former imperial city, that a scholarly Chinese dawn stroller taking his caged songbird for a walk saw Pamela’s dead body lying in a ditch. Her face and body had been so hideously mutilated that the identity of the corpse could only be established by means of her ripped clothing and her expensive and elegant wristwatch, suggesting that she was not killed for material gain. It was just one month before what would have been her twentieth birthday. Werner was seventy-two. As for Pamela’s father, he made a self-insulating cult of his loneliness. It may indeed have been true that he disliked most people he met, and that he made no attempt to conceal it. His rudeness was sincere, and life had not been easy for him. In some of the darker passages, Werner calls to mind the crazed sinologist Peter Kien in Elias Canetti’s wondrous novel Auto da Fé. Like Kien, Werner spent much of his life with his Chinese texts in his spacious study, tracking, in his case, the arcane terms in early texts on Chinese mythology, his great passion, and carefully collating their variants and shifting popular and scholarly usages. Werner made long treks on his own to China’s border regions, seeking linguistic clues and filling in the gaps in his knowledge, leaving Pamela alone at the house—albeit with several trusted servants and her own former amah—a combination nanny and maid—to keep an eye on her. Whether or not French has managed to fully solve the case of Pamela, as he believes he has, his book is full of valuable swerves and tangents. For example, Midnight in Peking serves as a tightly orchestrated study of the little streets and alleys that crisscrossed the southeast corner of old Peking. It is hard not to be brought fully into the tale when the streets come so clearly into focus, as we get to remember certain street and house numbers that slowly, with familiarity, toll like a knell through the actions and plans of the characters in French’s book, through their schemes and their (not always correct) solutions. We remember how long x takes to get to y by foot, by bike, and by rickshaw, and where in the city one man’s moves were obvious, and when they were carefully concealed. We too traverse the same lanes day by day, and we too want the protection of darkness as often as we seek its aid. The story draws much of its power from the fact that Pamela is our guide until her death, and that thereafter it is Werner in his trusty old gabardine coat and his wrap-around sunglasses as his protection from the glare and the dust who stops us from losing our way. The results of those years of hunting are the coda to French’s book, and it becomes the reader’s task to separate fact from hypothesis. The case back in January 1937 seemed so clear that surely the guilty killers would be caught and punished. But that has not happened. Werner stayed on in China until 1951, when he was almost ninety. If historians have a paradise maybe he is there, arguing still, and irritating everyone, for the right reasons.